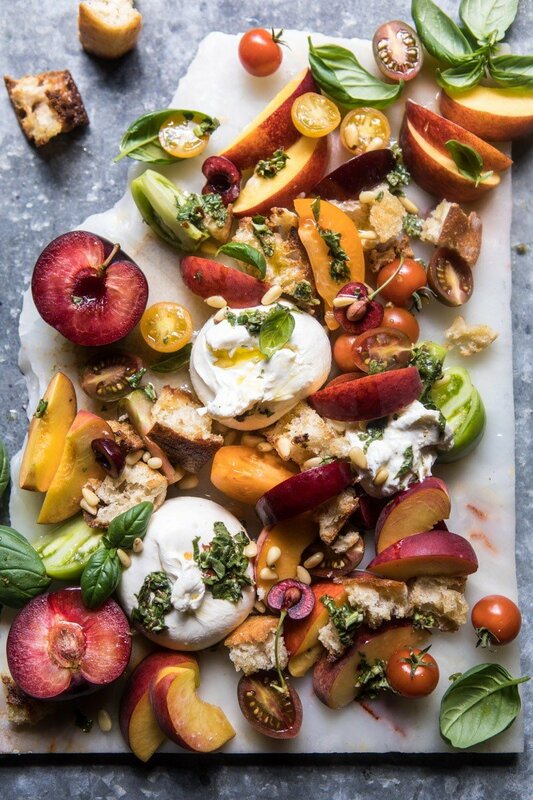 It may be somewhat of a mouthful to say, but with fresh toasted bread, summer stone fruits, heirloom tomatoes, and basically all the burrata cheese I could get my hands on. Yes, this is most definitely my kind of salad. Do you guys ever have those days when all you really want to eat is cheese and fruit? No? Is that just me? 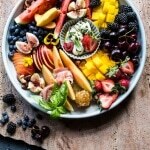 Well let me just put the idea into your head, cheese + fruit = the perfect anytime meal. This salad is basically that awesome combo, but even better, because I added bread! I love it, and could honestly eat this salad everyday for the rest of the summer. It’s just that good. 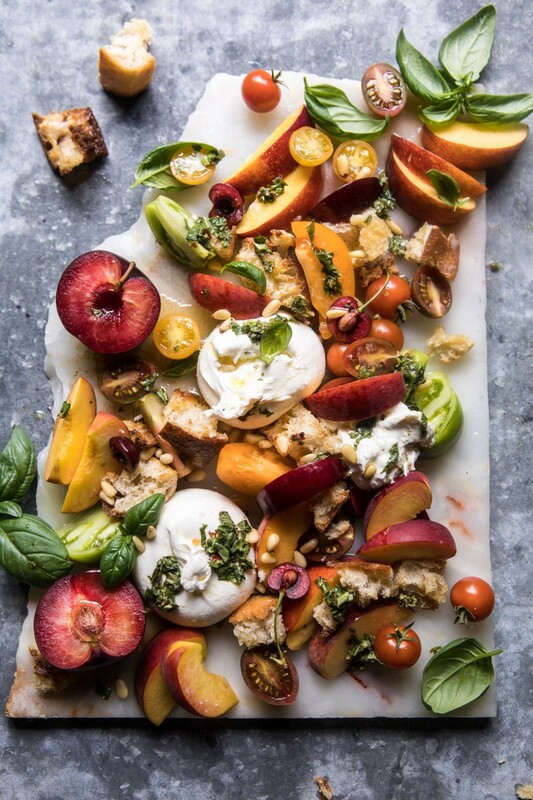 But I mean, how could anything with these ingredients (hello stone fruits and burrata cheese) not be amazing? Way back in the beginning of June I made a promise to myself to really embrace all the produce of summer. I decided that I wanted the majority of the recipes I share with you to be focused around produce that is in season. So far I haven’t broken my promise or gotten bored with any of my recipes (hello to this farmers market pasta, this raspberry ice cream, and this blackberry mojito). 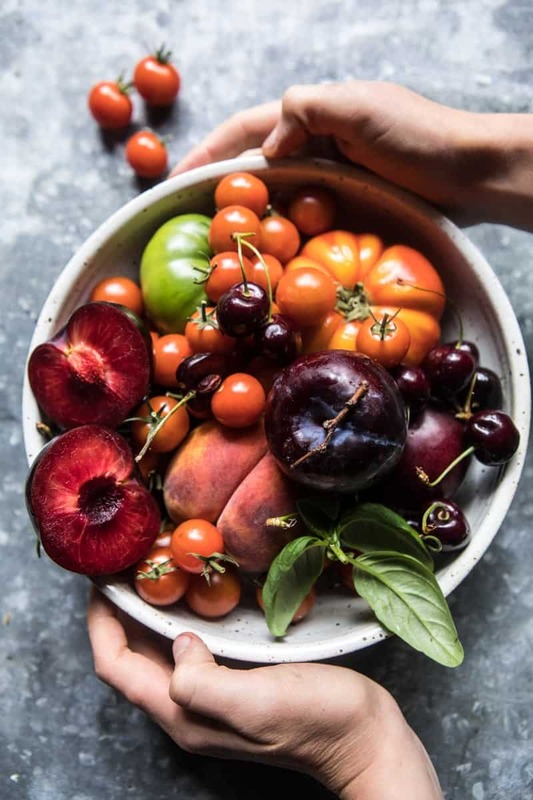 I’m loving the way I’ve been able to find inspiration from all of the beautiful produce at my local grocery and farm stand. Random thought here, but speaking of September?!?!?! 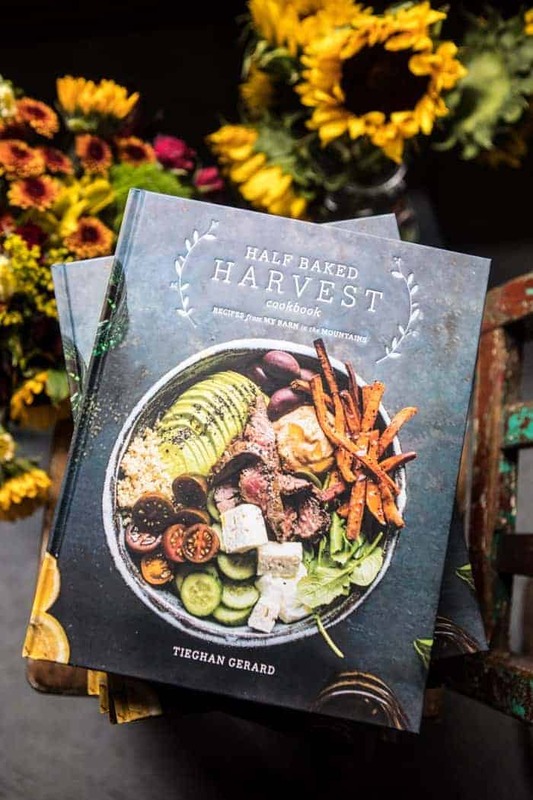 I can’t believe we only have a little over two months until the Half Baked Harvest Cookbook is released. Ahhh!! I am so nervous, but also so excited! We have some really fun events planned for the release and even some great pre-order bonus content too! Have you guys pre-ordered your copy yet? Okok…sorry, staying focused and on topic from here on out. 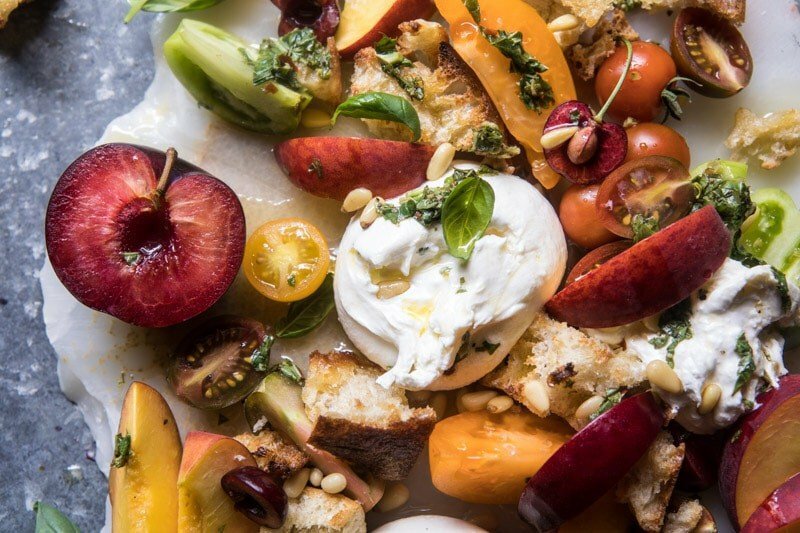 Panzanella salad? Have you guys ever had it? Have you ever heard of it? If not, it’s a pretty simple concept. It’s a toasted bread and vegetable salad that I believe originated in Tuscany. Typically it’s made with vinaigrette, toasted bread, tomatoes, cucumbers, herbs, and mozzarella, but today I am sharing my summer twist on it! Like the traditional panzanella salad, I’m using torn ciabatta, tossing it with olive oil and toasting it. 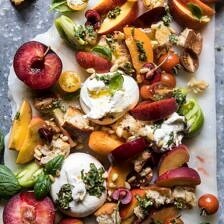 BUT, here is where this salad gets really fun, instead of the typical vegetable and herb combo, we’re going to use the most delicious stone fruits of summer! I used a combo of peaches, nectarines, black plums, and cherries. So basically all my favorite fruits. 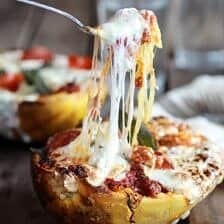 And instead of mozzarella? 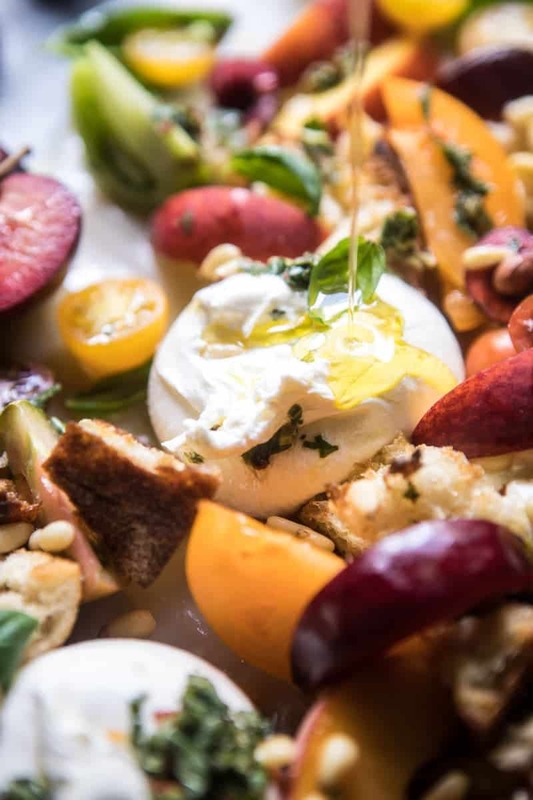 Yes, BURRATA! You guys know how obsessed I am with this cheese, so anytime I can use it, I will. 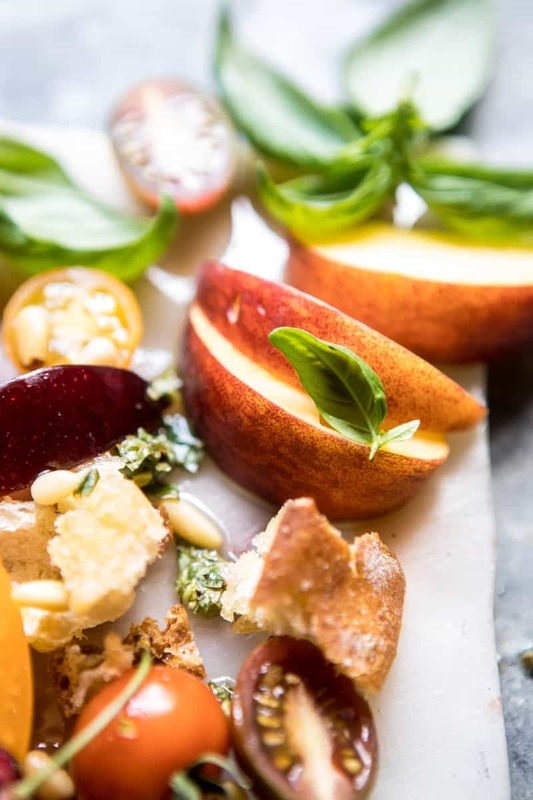 Burrata is the perfect cheese pairing with all these stones fruits, its creaminess works so well when combined with the crunch from the fruits, while its subtle flavor compliments the fruit’s sweetness. 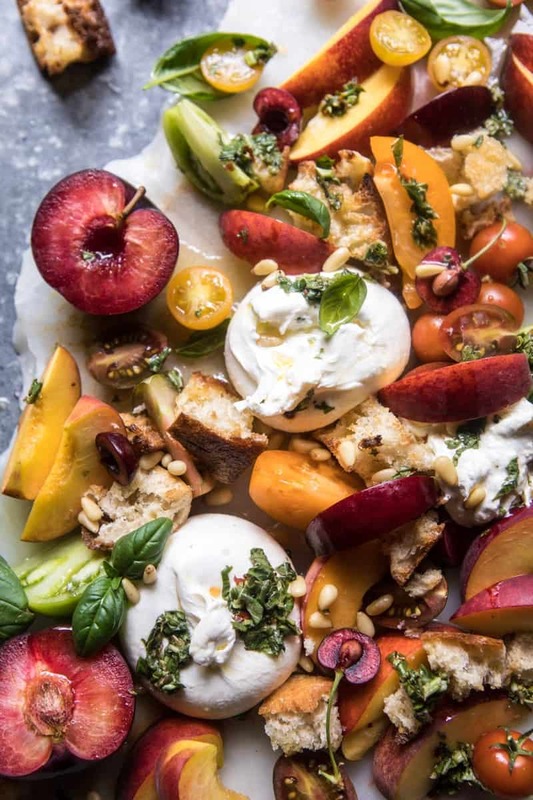 Just trust me, the burrata is so good, and perfect in this salad. Of course you could use regular mozzarella or even ricotta, but if I were you, I’d go with the burrata. Tip: always go with the burrata when given the opportunity. 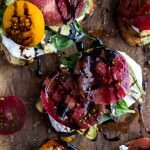 One of the keys to this salad is letting it marinate in the vinaigrette for a bit to allow the flavors from the vinaigrette to really soak into the bread and the fruits. Five to ten minutes does the trick, but letting the salad sit for an hour or even overnight is ideal, as it really amps up the flavor. This salad is also great for entertaining. You can make it completely in advance. Then all you need to do before serving is add the burrata, a little olive oil, and some fresh basil and you’re ready to eat! If you wanted to kick the salad up a notch, adding some thinly sliced prosciutto would be delicious. Just add it with the burrata before serving. I’m thinking this would make for the perfect 4th of July salad, right? 2. 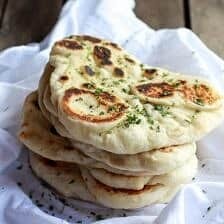 On a baking sheet, combine the bread, 2 tablespoons olive oil, and a pinch of salt. Transfer to the oven and bake for 8-10 minutes or until the bread is toasted. 3. To make the vinaigrette. 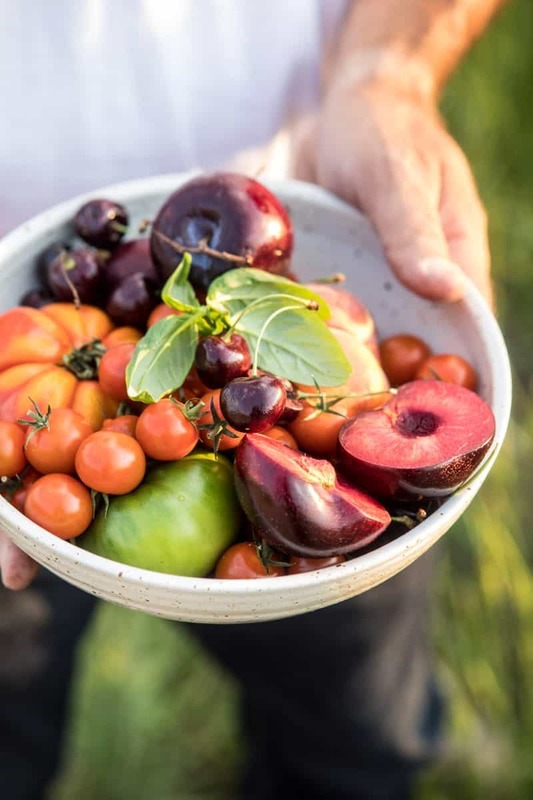 In a mason jar, combine the remaining 4 tablespoons olive oil, the red wine vinegar, lemon juice, basil, oregano, and a pinch of crushed red pepper flakes. Season to taste with salt and pepper. 4. 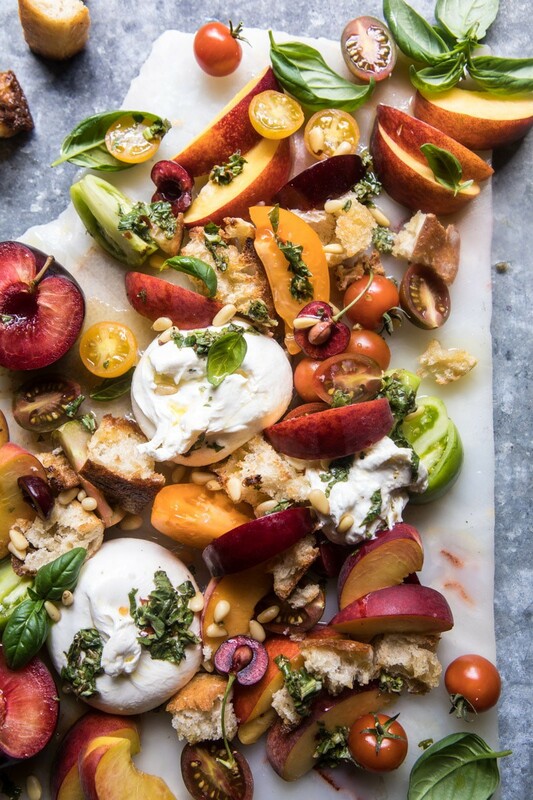 In a large salad bowl, combine the toasted bread, peaches, tomatoes, cherries, and pine nuts. Add the vinaigrette and toss well to combine. Let sit 5-10 minutes or cover and chill for up to overnight. 5. Break the burrata over the salad, drizzle lightly with olive and season with salt. Top with fresh basil. Enjoy! 4th of July salad today…4th of July dessert tomorrow! It has your name and mine too!! Yuum! I hope you love this! Thanks Rebecca! 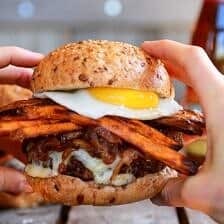 This looks soo delicious. 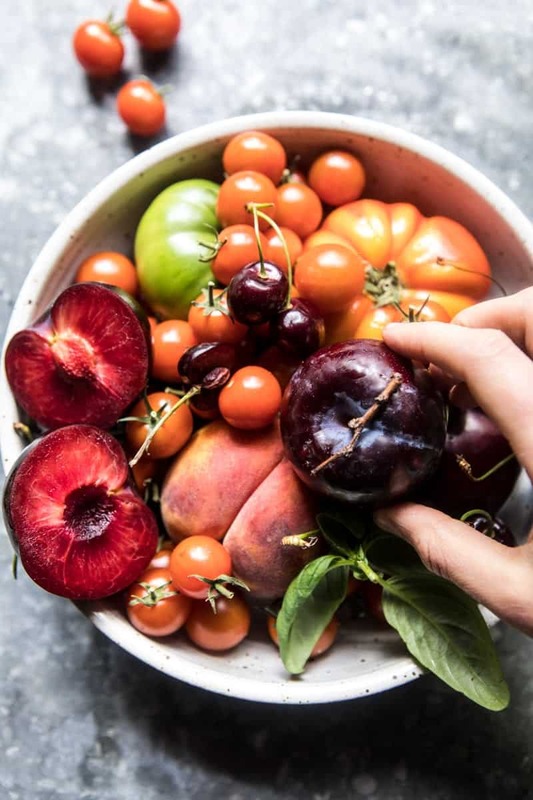 Stone fruits are one of my favorite things about summer. 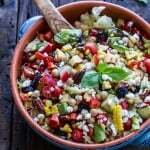 And I love that this salad incorporates all the best in it! Gorgeous!! Great for dining al fresco this summer!!! This looks a perfect appetizer for a dinner party on the patio. Pretty. Fresh. And YUM!!! Totally agree! I hope you love it, thanks Penny! 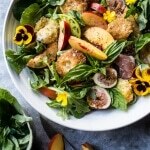 Such a stunner – I’m absolutely in love with this salad! Stone fruit? Burrata? Panzanella? I know what I’ll be eating for the rest of the summer! Haha yes me too!! So glad you like this Jennifer! Lol I think I could too! Thanks so much Matt! Seriously all of my favorite things! looks SO incredibly delicious! love this! What a great summer salad Tieghan! All my favorites right up in there! Woo! So happy you like this Mary Ann! Thank you! Oh love love this and burrata, the best. Yum!! Thank you Asha! I hope you love this salad! Haha this is awesome! I am so glad you love this Brynn! Thanks! I could live off this all summer and nothing else. Not even exaggerating. LOVE! So so happy you’re loving this recipe! Thanks Gina! What a summer dream! The dish contains everything I love to eat right now. I hope you love it! Thanks Neni! I made this tonight and it was soooo good! The fresh fruit with the vinegrette was amazing. 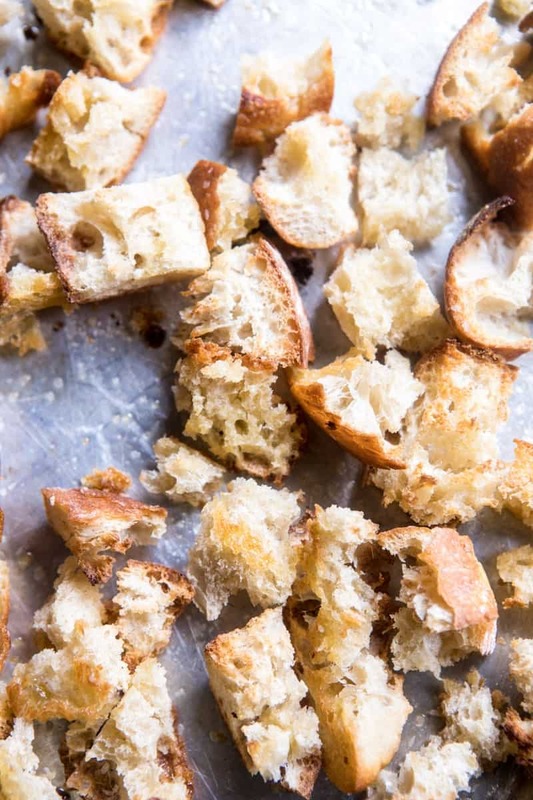 Instead of croutons I made crusty sourdough toasts to go along side… so more of a fruit salad with mozzarella and toast, but still dinner nonetheless. Loving the summer produce! Hope you had an awesome time in Mexico! Ooo sounds amazing! I am so glad it turned out great for you Libby! Thank you! Do you think adding some bib lettuce to this salad would work? 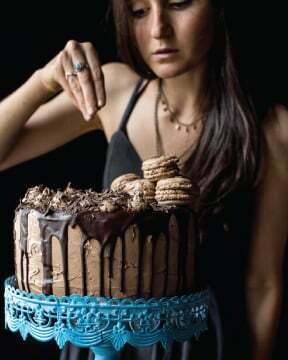 Hoping to make this tonight and add some greens in. I tried the salad with bib lettuce and this salad.. well it left me speechless. 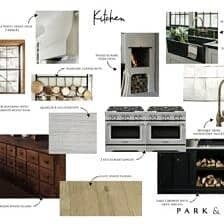 Girl, your recipes rock EVERY SINGLE TIME with taste, color, and variety. Btw, burrata cheese is a game changer. I’m hooked. Haha right?! Burrata is the BEST! I am so glad you loved this salad too, thanks Ella! Ah I don’t know! I think just making so many recipes I just start trying new things! Believe me there lots of fails going on behind the scenes! WOW! So so cool you have made that many of my recipes (: Thank you David!